A Friday night game in Bournemouth meant that I had to take the morning off work to travel and then spend the afternoon in my hotel room calling into work teleconferences. All of that ensured that there was no time for a walk on the beach, which was rather sad. But the pub of choice in Bournemouth was delightful even if the cider was a little strong. Team news was that there were two changes from the magnificent win over Blackpool with Munari and Watson replacing Paredes and Vydra. 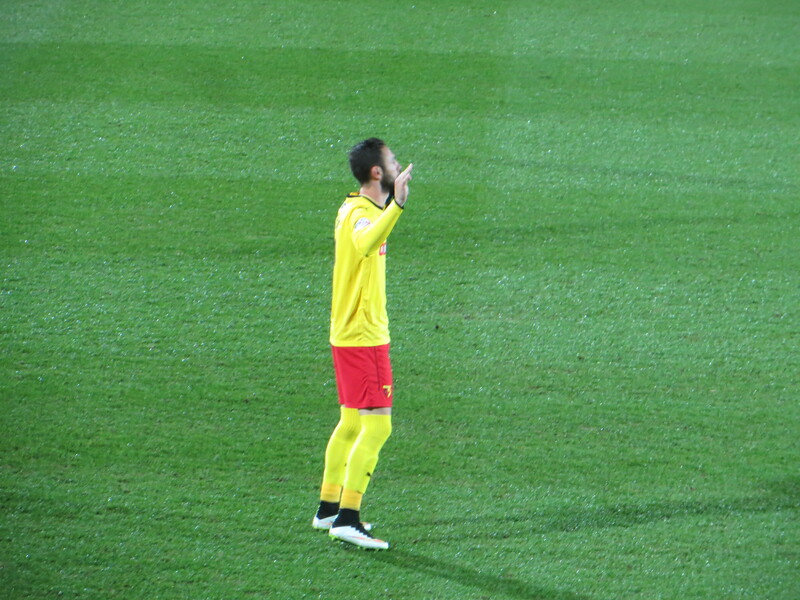 The starting line-up was Gomes, Hoban, Angella, Cathcart, Anya, Tözsér, Watson, Munari, Layun, Deeney and Ighalo. 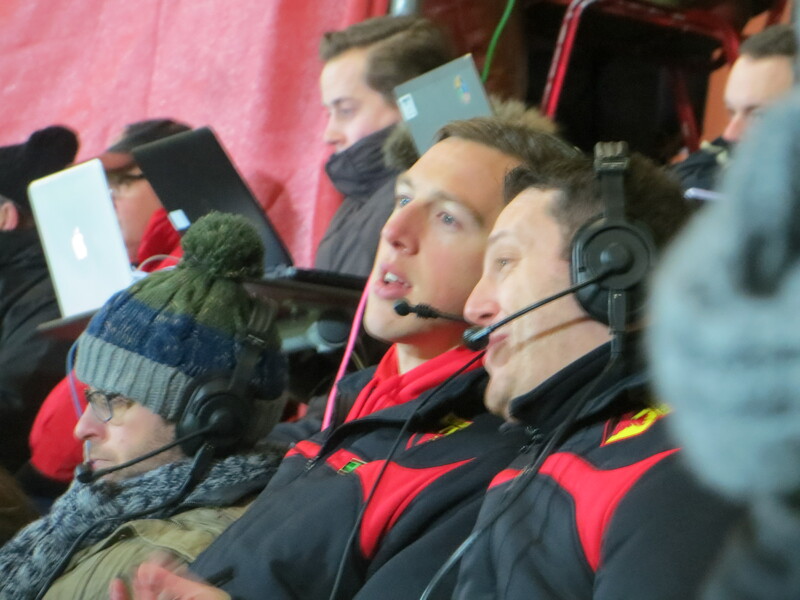 As we took our place in the stand, I was surprised to see that we were adjacent to the press area and that Jon and Rene were required to commentate on the game while sitting between the banks of home and away fans. We’d been looking forward to this game all week, but it went horribly wrong in the first minute when Kermorgant dispossessed Tözsér, played Miller in and Angella took the escaping player down. The whistle went and the Bournemouth players surrounded the referee who emerged brandishing a red card. It seemed very harsh, especially as Cathcart was covering. You have to wonder what the sea air does to referees facing Angella. Although, at least on this occasion, he wasn’t dismissed for his remarkable resemblance to Fitz Hall!!! With such an early dismissal, it felt like the game was over already. 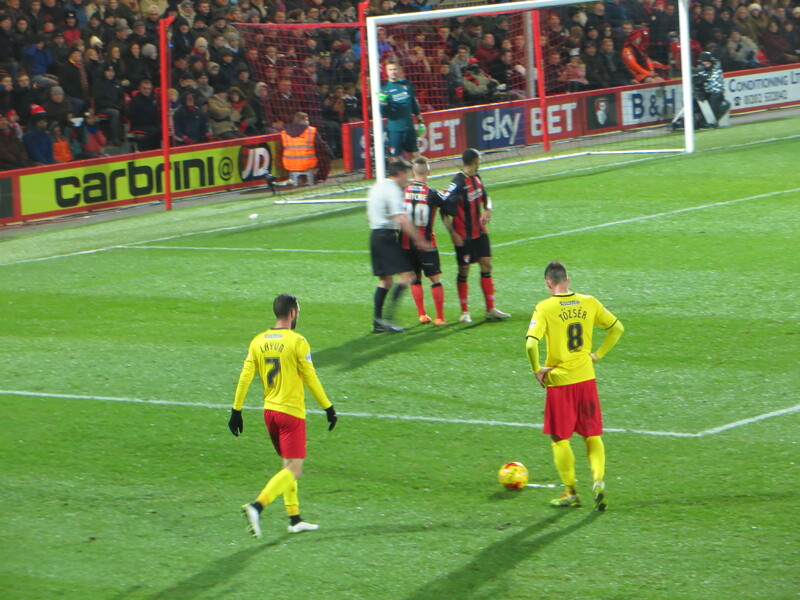 Kermorgant took the free-kick himself which deflected off the wall for a corner from which Pugh headed over. Watford rejigged the defence with Layun and Anya dropping into a back four. Bournemouth threatened immediately with a curling cross from Ritchie that was palmed away by Gomes. Then Deeney broke down the other end and played the ball out to Anya who shot wide of the far post. The lovely Ighalo then indulged in a spell of showboating to cheer up the travelling Hornets. Bournemouth threatened again as Ritchie cut inside and shot wide. But Watford also had chances as Ighalo fed Munari who tried a shot from distance which was blocked. Then Anya floated a high cross into the box that was caught by Boruc. The home side had a great chance to take the lead in the 24th minute, but Kermorgant’s shot rebounded off the crossbar. A great run from Deeney was stopped by Cook who only received a yellow card for the offence, which was greeted with anger from the Watford fans. From Tözsér’s free-kick, the ball broke to Watson who shot just wide. Soon after, the ball flew into the Watford crowd signalling a Bournemouth throw. The away fans decided to indulge in a spot of volleyball and showed no sign of giving the ball back, so Ighalo came over and requested that it be returned in such an endearing manner that the ball was immediately thrown back onto the pitch. With 10 minutes remaining in the half, Wilson was tripped by Cathcart in the box and the referee pointed to the spot. With the team down to 10 men and working their socks off, a penalty against us seemed just cruel. Kermorgant made no mistake from the spot to give the home side the lead. Arter was very lucky not to follow Angella to the dressing rooms as a two-footed tackle on Munari was deemed worthy of only a yellow card. Bournemouth had another goal chance but Wilson’s header flew wide of the far post. Watford could have been in further trouble as Gomes parried a cross, but Cathcart was on hand to put it out for a corner that was easily gathered by the keeper. When the half time whistle went, there were loud boos from the Watford fans targeting the referee for his appalling decision in sending Angella off. At the start of the second half, Munari made way for Pudil, allowing Anya to move to the right and Layun to move up to the midfield. Bournemouth had a good chance to increase their lead on 50 minutes as a Cathcart clearance fell to Ritchie who shot wide of the target. At the other end a shot from distance by Tözsér was caught by Boruc. Bournemouth increased their lead in the 56th minute as Ritchie received the ball on the right of the box and buried it in the far corner. As much as it pains me to say it, it was a quality goal. 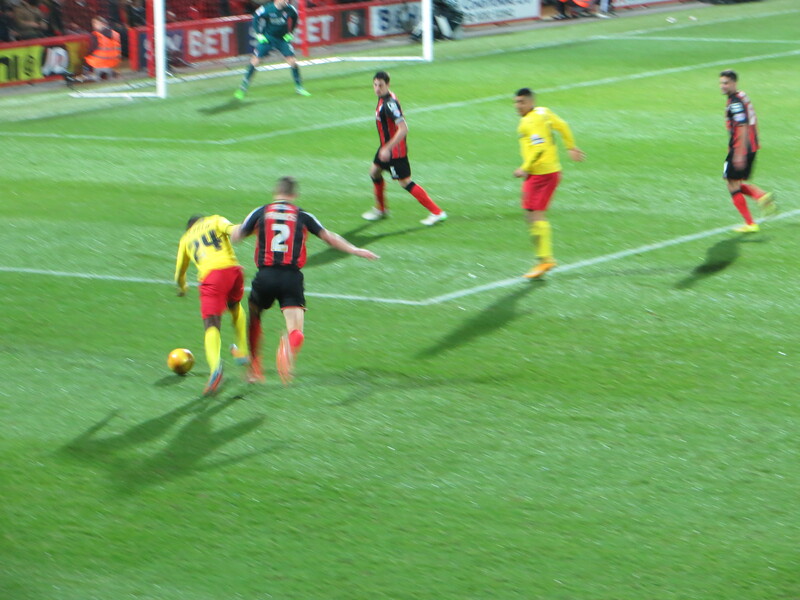 Watford tried to hit back as Ighalo played a through ball for Deeney, but he was tackled before he could shoot. A lovely Bournemouth move finished with a shot from Francis that Gomes dropped to smother. It looked as if Bournemouth would increase their lead with a powerful header from Kermorgant that Gomes did brilliantly to push wide. Jokanovic made his second substitution bringing Vydra on for Ighalo. I must say that I didn’t see that coming. Bournemouth threatened again with a low shot from Francis that was gathered by Gomes. Ritchie tested the Watford keeper again, but Gomes was equal to his shot. 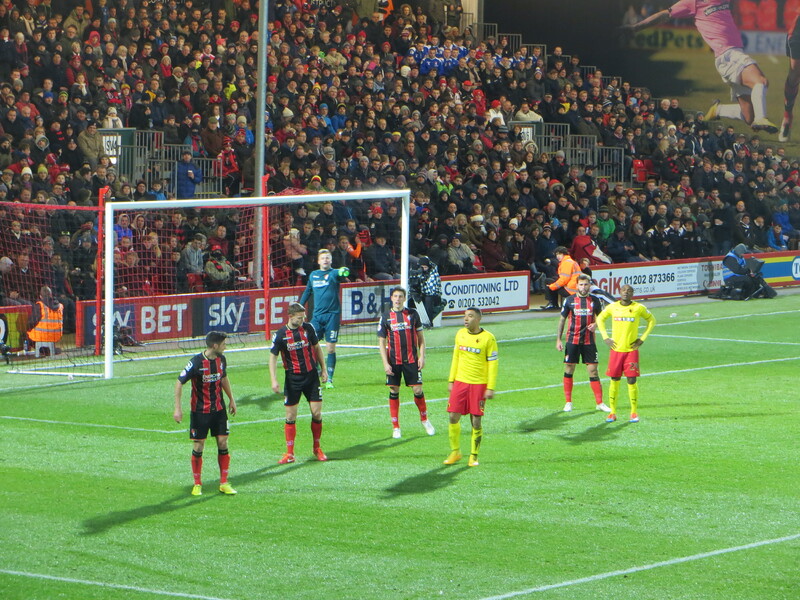 Watford had a rare attack as Vydra played a square ball to Deeney who shot wide of the far post. Bournemouth’s final attack started with a push on Anya that should have been penalised, but they broke forward resulting in a shot that needed another excellent save from Gomes. In injury time, Mensah replaced Deeney, presumably for some first team experience. After the final whistle, the Watford players all came over to thank the Watford fans who had continued to sing in support of their team for the entire 90 minutes. We went into this game anticipating an exciting top of the table clash. The sending off in the first minute meant that we will never know whether we could have overcome Bournemouth with eleven men. With the game being changed to Friday evening for television, it also meant that most fans attending had to take time off work and possibly find accommodation for the night due to the lack of public transport home after the game. In these circumstances, when a refereeing decision has such an impact on the outcome of the game, you feel doubly cheated. Let’s hope that we can take this anger into next week’s game. This entry was posted in Watford FC and tagged Adam Smith, Andrew Surman, Artur Boruc, Ben Watson, Bernard Mensah, Bournemouth FC, Brett Pitman, Callum Wilson, Charlie Daniels, Craig Cathcart, Daniel Pudil, Daniel Tozser, Eddie Howe, Eunan O'Kane, Gabriele Angella, Gianni Munari, Harry Arter, Heurelho Gomes, Ikechi Anya, Marc Pugh, Matej Vydra, Matt Ritchie, Miguel Layun, Odion Ighalo, Simon Francis, Slavisa Jokanovic, Steve Cook, Tommie Hoban, Tommy Elphick, Troy Deeney, Watford FC, Yann Kermorgant on January 31, 2015 by franelynn.